Fill up with your favorite craft beer and enjoy it at home with our personalized amber glass growler. Or give that special beer lover or beer brewer a gift they will love. The ideal addition for their bar glassware, this beer growler is made of amber colored glass and features a screw-on cap. 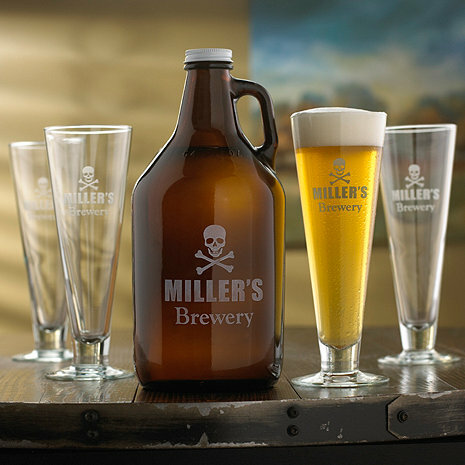 Fill up with your favorite craft beer and enjoy it at home with our personalized amber glass growler. Or give that special beer lover or beer brewer a gift they will love. The ideal addition for their bar glassware, this beer growler is made of amber colored glass and features a screw-on cap. The amber color blocks out harmful UV rays which are responsible for causing beer to taste "skunky". Great for the outings to the local microbrewery or for the home brewer. Holds up to 64 oz and set of 4 pilsner glasses 16 oz each. "Word Brewery is included on second line"
The Story of the Growler: In the late 1800s, fresh beer was carried from the local pub to your home in a small pail. When the beer sloshed around the pail, it create a rumbling sound, and the term "growler" was coined.